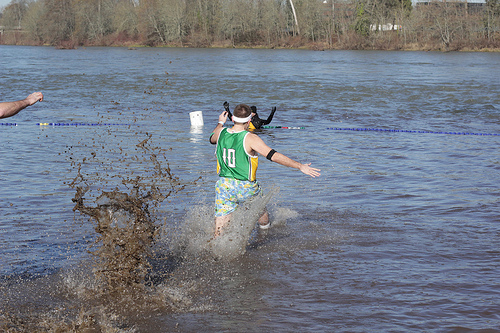 The University of Oregon's Association of Fundraising Professionals student chapter is aiming to raise $3,000 for Special Olympics Oregon this year, by hosting a "Pre-Plunge Party" as part of its participation in the annual Eugene Polar Plunge. The Pre-Plunge Party will be at 7 p.m. on Sunday, Jan. 27, at Cozmic, 199 W. 8th. Ave., in Eugene. The suggested donation for admission is $5. Entertainment will include live music by Kingdom County and Brendan Curran, plus comedy by Jennifer Sparklebritches. There will also be raffle prizes and a chance to have photos taken with the polar bear mascot. The UO Fundraising Professionals group is one of many teams participating in the Feb. 2 Eugene Polar Plunge, which is a Special Olympics fundraiser. The Plunge, at Eugene's Maurie Jacobs Park, will be at 11 a.m. The student group hosts a “Pre-Plunge Party” each year to raise funds to participate. Groups must raise a minimum of $50 to have the chance to plunge into cold February water of the Willamette River. For additional information, contact Kayla Bowcutt at kbowcutt@uoregon.edu.